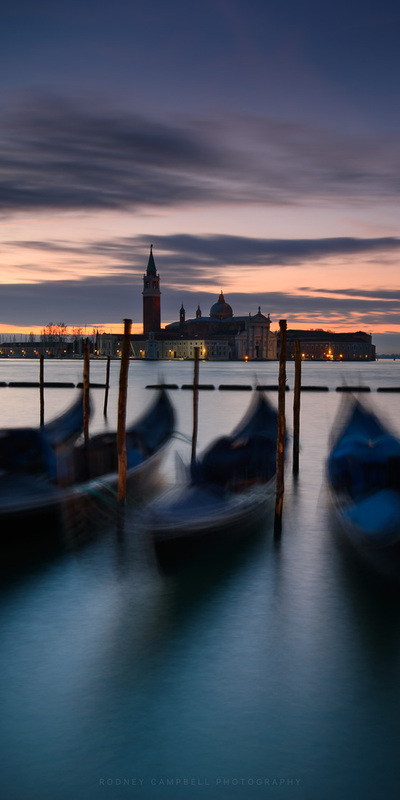 Another of those “classic” photographic locations is looking across the lagoon the church of San Giorgio Maggiore with the gondolas in the foreground. 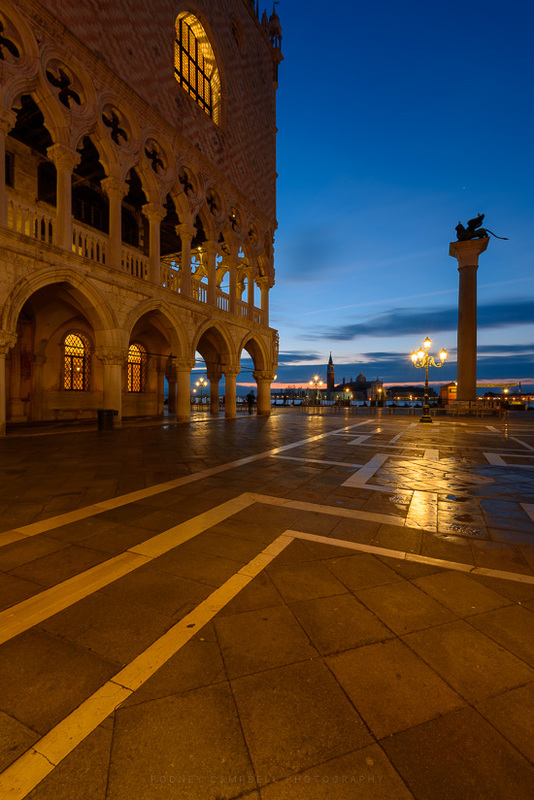 The view is from Riva degli Schiavone (the water front promenade) in front of the Palazzo Ducale. It was still 30 minutes till sunrise so it was time to get out the graduated ND filters and long exposure this whole thing up. 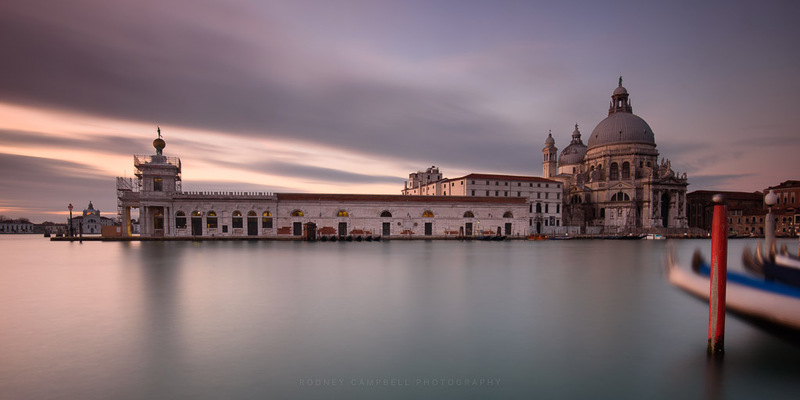 I’d read online about this other “hidden” photographic location nearby (just two minutes walk to the west from S. Marco) with a good view of Basilica della Salute & San Giorgio Maggiore over the canal. The view from the wooden docks as you can see was pretty good – however the wooden structures moved a little with waves and boats so you had to time your shots very well and use appropriate shutter speeds (either short or very long) to deal with the slight movement. 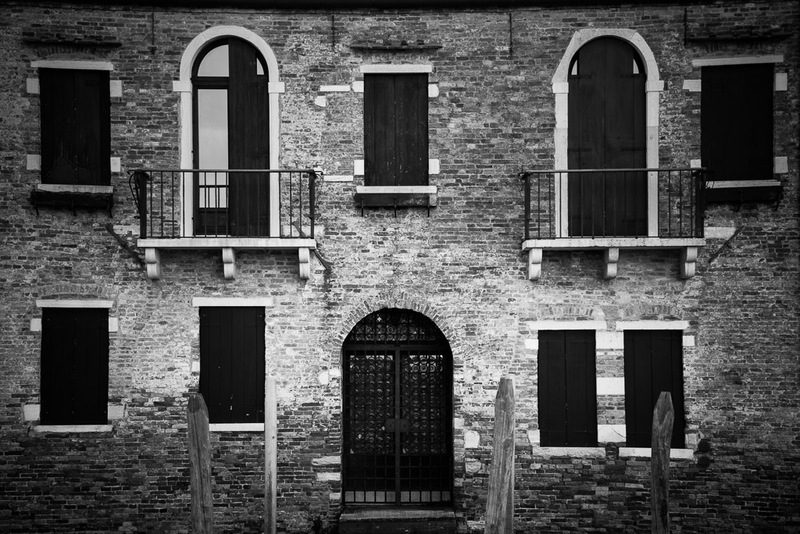 Before we left Australia I’d actually done a little research and planning for some photography locations whilst in Venice. As it happened 🙂 a majority of the most popular photographic locations were very closeby (a short walk (5-15 mins)) from our apartment. 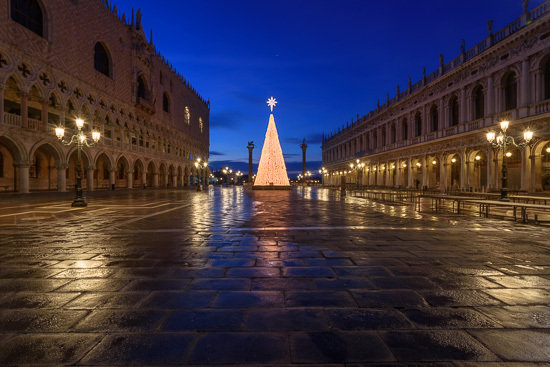 So for my first morning in Venice I headed out before dawn to see sunrise in St. Mark’s Square. It should have been a 5-10 min walk but, well, I’d never been here before and it was still fully night so it was a bit of a random walk in roughly the right direction before I got here :). I was still here way before sunrise – this is just before 7AM (with sunrise at 7:50AM – I mean how easy is that – sigh…). This is the only time you’re going to see the square this empty. During the day this place is a madhouse :). 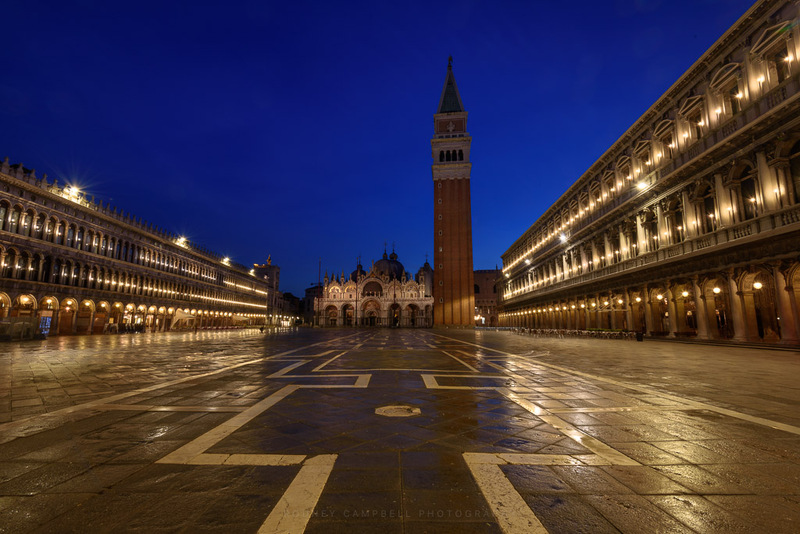 St. Mark’s Square (Piazza San Marco) is Venice’s only square with the title of “piazza” – the rest are called “campo”. The square is dominated at its eastern end by the great church of St Mark and the Campanile di San Marco, a 99-meter guard tower from the 8th Century. 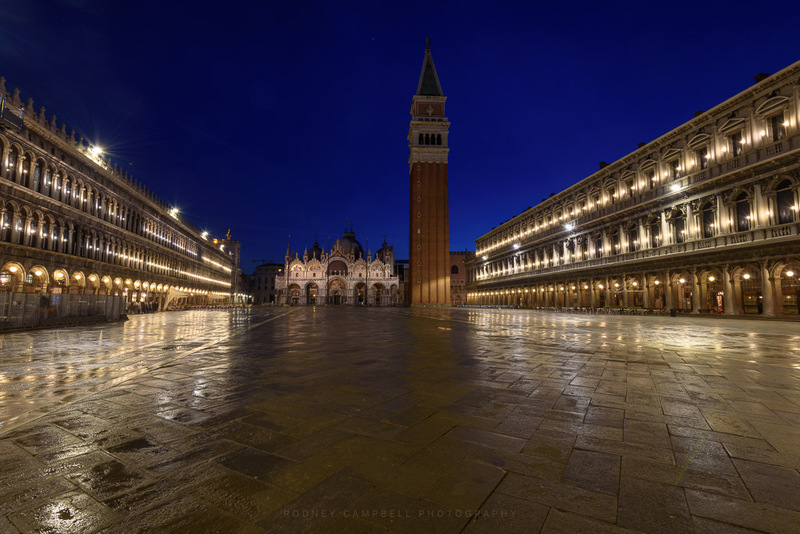 Head towards the church and to the right of the Basilica is Piazzetta di San Marco with the Palazzo Ducale, or Doge’s Palace (on the left) and a view out over the lagoon to San Giorgio Maggiore. It’s still 35 minutes till sunrise and the few other people around are mostly other keen photographers :). 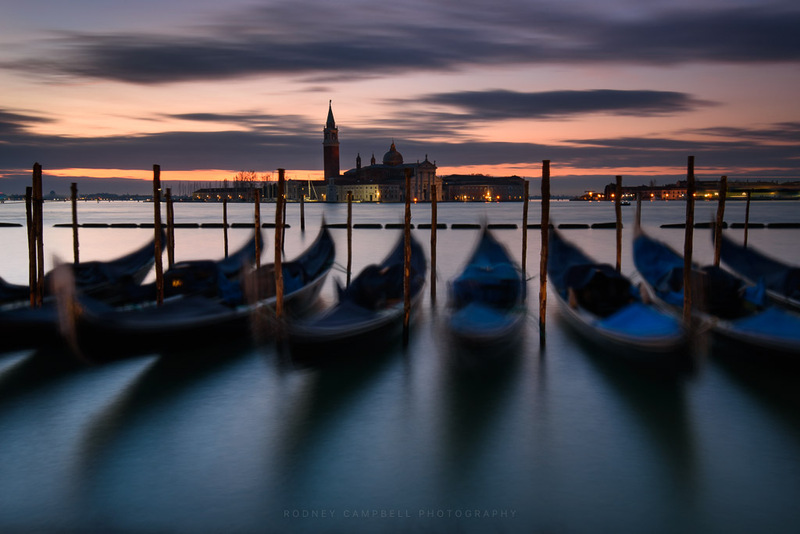 Want that iconic shot of Venice? This is the place to be! 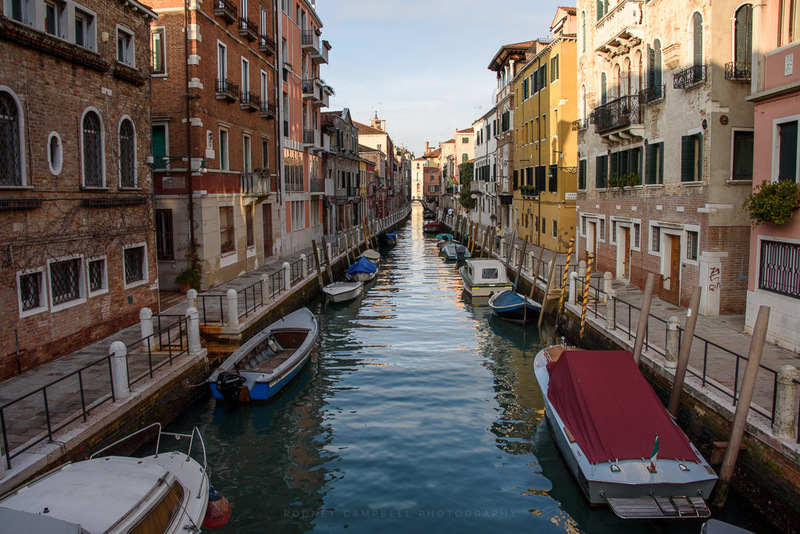 After an afternoon of exploring the laneways of the Dorsoduro neighbourhood we were heading back over the Accademia bridge into the neighbourhood of San Marco (where our apartment was located). 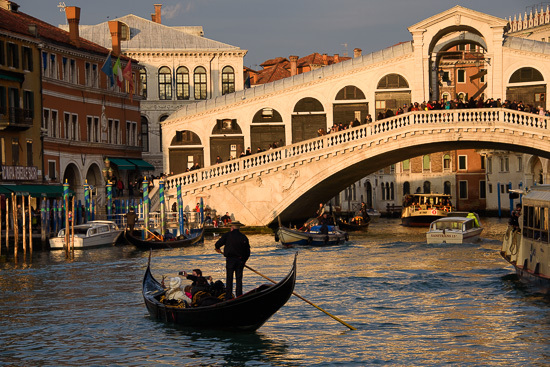 The Ponte dell’Accademia is one of only four bridges to cross the Grand Canal. Once you’re on the bridge, face east back towards Piazza San Marco and the perfect scene will open up before your eyes. 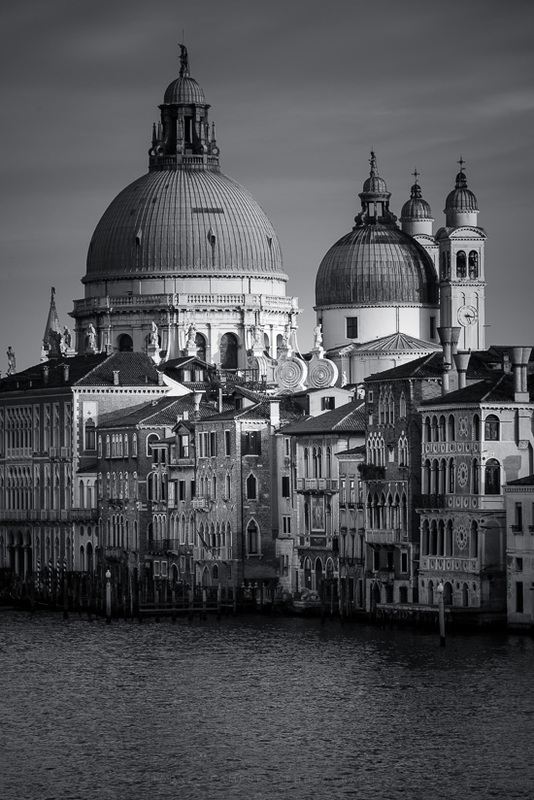 The dominant St Maria of Salute Basilica is a great point of focus and the historic facades of buildings that appear to float over the canal. 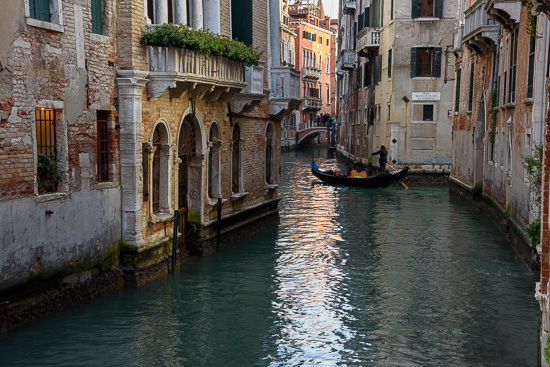 As is expected with a city built entirely on water there are canals everywhere both large (like the famous Grand Canal) and small. 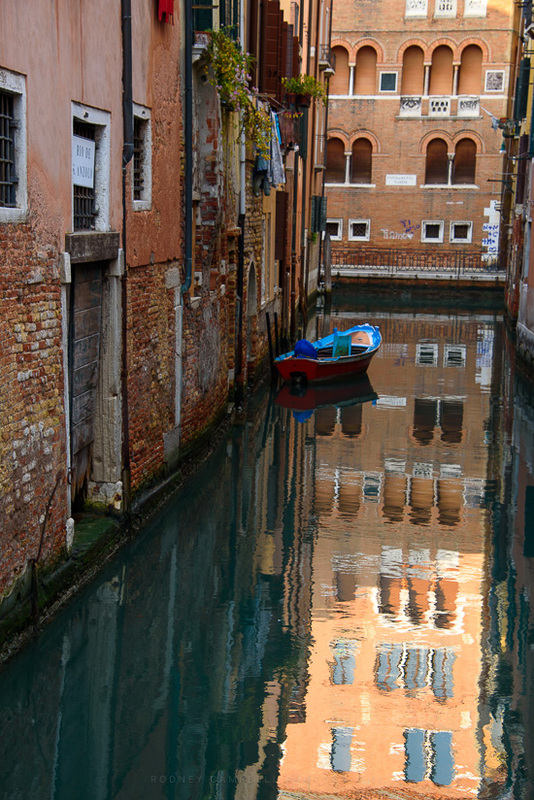 Getting around Venice on foot involves walking through all these sometimes quite narrow laneways between all the tall buildings and finding the bridges which cross the canals to get to the next section of land. The view from near our apartment down the grand canal towards the famous Rialto Bridge near sunset. The Rialto is the oldest of the four large bridges spanning the Grand Canal in Venice. It connects the sestieri of San Marco and San Polo and is today one of the top tourism attractions in Venice. 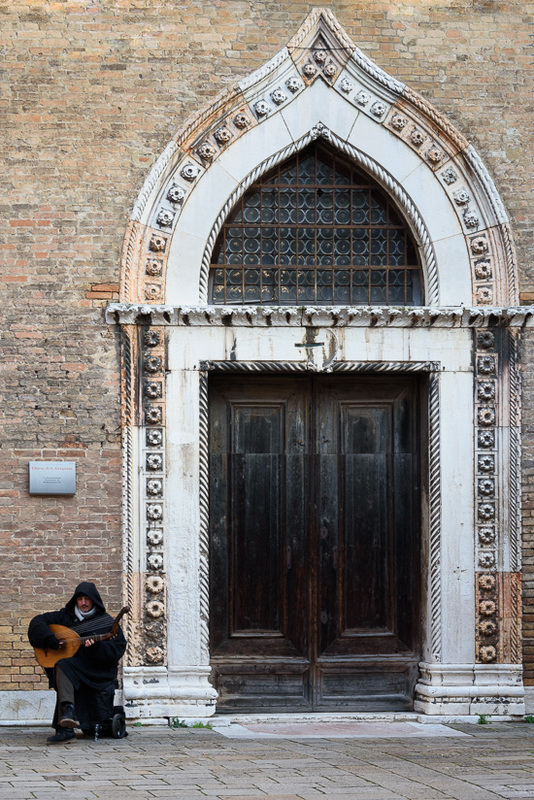 The areas around the bridge (especially on the San Marco side) is very touristy and is packed at all hours of the day and night. Time to head back to the apartment and see the kids. 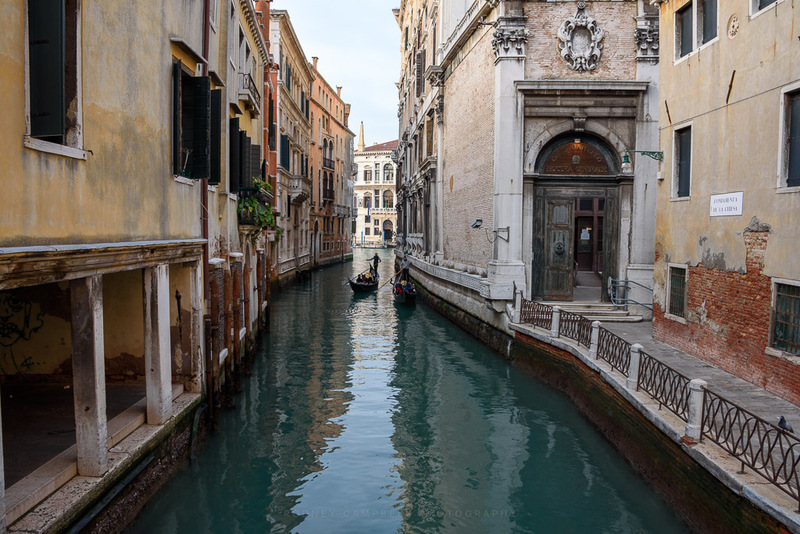 This canal which leads right out into the grand canal is right near our apartment. 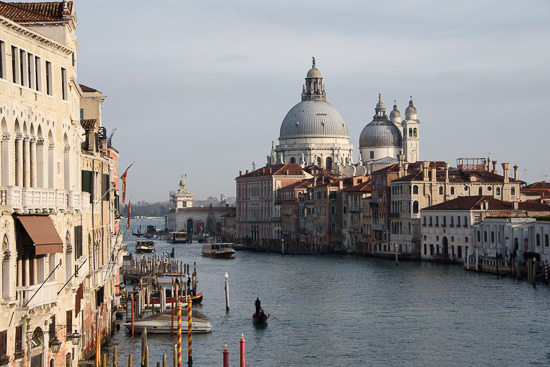 This is the view from Fondamenta Salute (which is the the path leading around to the point just past Basilica di Santa Maria della Salute). 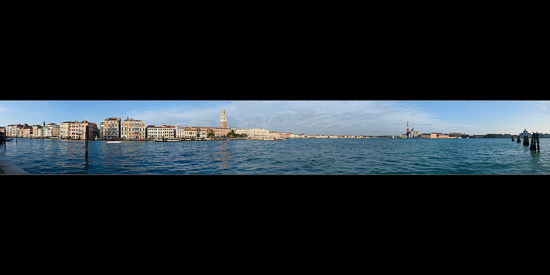 Offering a unique 180° view across the water all along the southern edge of San Marco (including Saint Mark’s Basilica and the Doge’s Palace) around past the small island with the Church of San Giorgio Maggiore and then Lido on the far right. 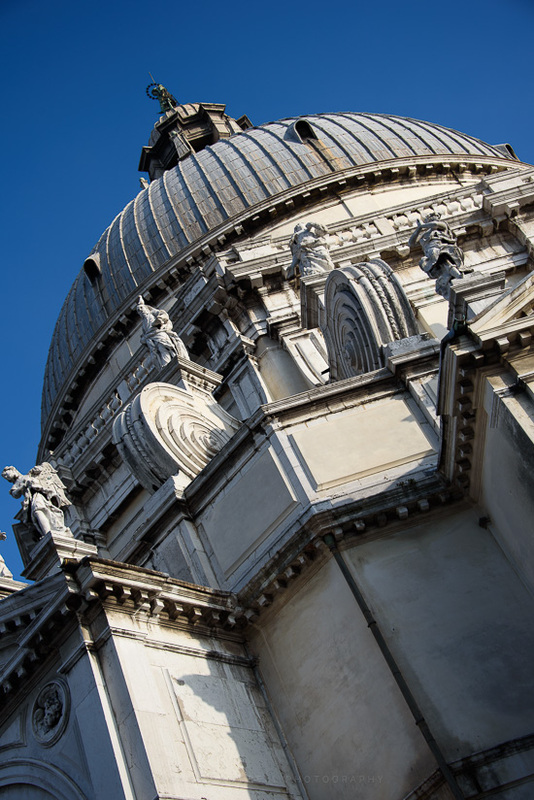 This is your go to location for scenic panoramic shots. It’s a little out of the way and not as crowded as the main waterfront walkways but the view is spectacular (when visibility is good). 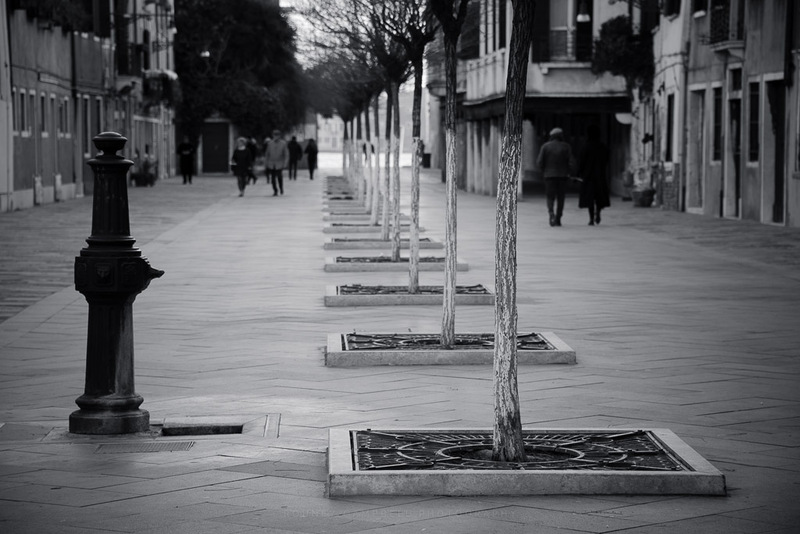 Tree’s are an unusual sight here in Venice – pretty much all of the land above water is paved with buildings or laneways. 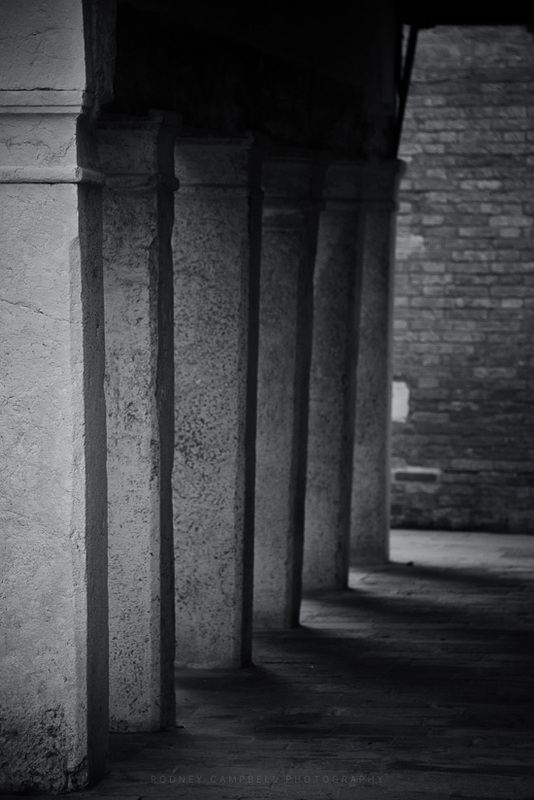 My wife are still wandering the laneways exploring Venice. 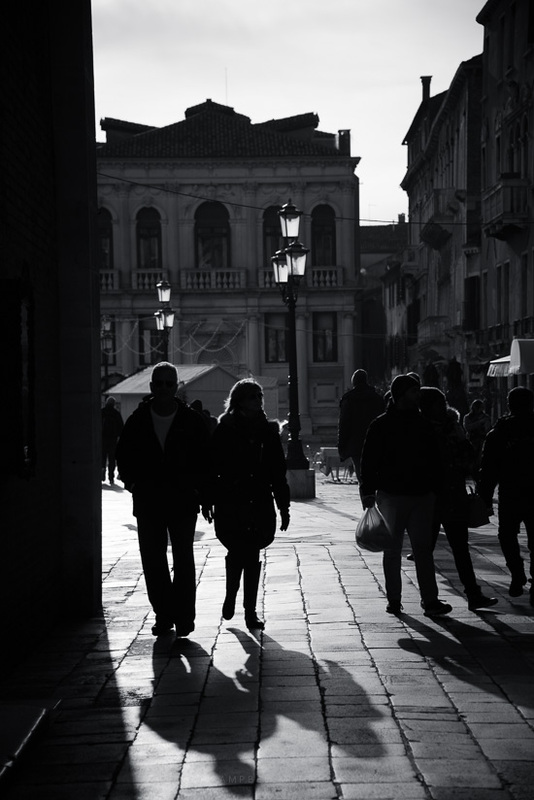 Many European cities are suitable for exploration on foot however this is especially so with Venice. They say the best way to see it is to just get lost – I can wholeheartedly agree. Of course you can (and should) take a Vaporetto ride along the whole Grand Canal but the best way to really experience Venice is to just explore the laneways of the various sestiere (or neighbourhoods) on foot. For instance we spent the first half of our afternoon exploring Dorsoduro (one of the six sestieri of Venice). My wife and I were keen to explore so we headed out for a walk. Our daughters weren’t so keen and decided to veg out around the apartment. I decided to head south west (away from the touristy areas) towards the Ponte dell’Accademia (or Accademia bridge). It is one of only four bridges which span the Grand Canal in Venice. It’s actually a very popular location for photographers so I was planning to come back here at sunset one day anyway. Once there I decided to head right around to the Basilica of St Mary of Health – the one you can see in the view from the bridge – and another location I had planned to come to at sunrise or sunset to do some photography (you can see a pattern emerging here I’m sure :)).